When I think about Italian foods my mind goes to my homemade ravioli's. These suckers take some time to make but let me tell you, it is well worth every minute you invest in this dinner! You will surely please anyone, and everyone who tries these! You can even cheat and use Organic Simple Truth canned pasta sauce (totally fine and makes it one less step). The 4 is PERFECT thinness! There you have them! They are so amazing and so delicious! I am obsessed with the emoji's, as is my entire family, from Kristopher to Kailee and Daniel! 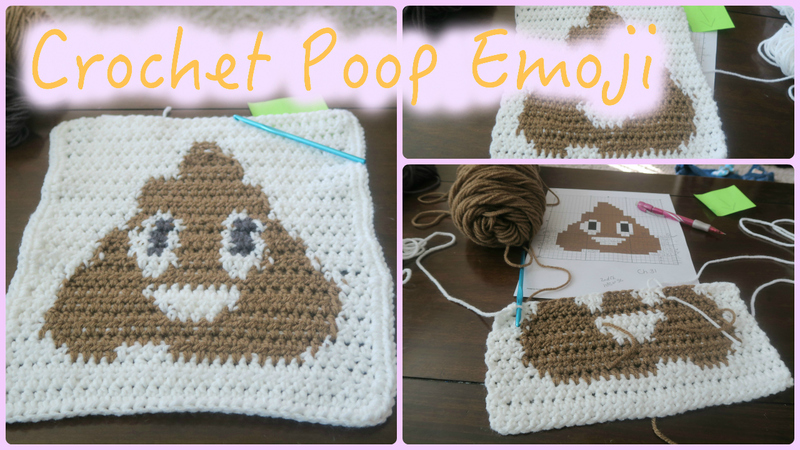 I thought what better way then to make a video of each emoji crocheted and then turn that into a big blanket for our couch! This is the first emoji I am going to be doing out of... (I do not know how many! We shall see! So please comment on the video and let me know what other ones you want to see). I used Switchboard.com to make the pattern and google to find the picture of the poop emoji. In the pattern it shows light brown and dark brown, I am going with just the dark brown for this; please feel free to use light brown if you wish. When making anything Italian I love making my own dough, yes it takes time to make the dough, roll the dough then cook the dough but it is so very rewarding when you complete the meal and enjoy something with no additives. And come on! This recipe has literally 3 ingredients you truly cannot beat that in a pasta! Kristopher has been bothering me for days, okay, begging me for days to make him pizza pockets.. all I hear is 'Mom, can you please make pizza pockets today?' 'Mom, what about now? Did you know, Mom, I can take these to school for lunch?' Insane... But when you look at the ingredients list in froze pizza hot pockets, one can expect to be disgusted and surprised all at once. What is the need to have so much crap in these? It honestly is not needed. They all say oh to preserve them longer... okay, these can hold in the freeze for 6 months (not that they last that long, because lets be honest here, when you buy hot pockets brand you eat two in one sitting and have two left- so again my question is why do you need all those additives?) It is really dumb, and 100 percent unneeded. Make these and freeze them for up to 6 months (if they last because in this house they do not). You can use your own homemade pizza sauce, I make this often and freeze it or can it, but just have not had the time lately. Therefore, I picked up a couple jars from Whole Foods Market because, well, let's be honest, I trust their ingredients most.